If you're looking for a fun way to introduce your children to a second language like Spanish or French then try this award-winning title ticket. Like the other titles in the Mia Collection, it integrates educational content into an original and entertaining story, so that children learn while they play. 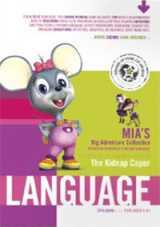 This latest "Mia" title also builds on the series' heritage of endearing characters, fun activities and broadcast quality 3D graphics. The player controls Mia throughout the game, where there are clues to find, useful items to pick up and decisions to make, all designed to encourage the player to think for themselves. Just when Mia's grandmother, Mimi is about to win this year’s art competition, the lights go out. When they finally come back on, Mimi is gone, and so are the Sparklies that were to be the prize. Romaine however is still around, so who could have done something this evil and why? Help Mia look for her granny and unravel the truth behind this caper, all while practicing Spanish or French as a second language.